(Bloomberg) -- J. Crew Group Inc.’s cash on hand dwindled even as sales accelerated for the heavily indebted apparel maker’s Madewell brand -- a development that may cause concern with debt holders. Comparable sales, a closely watched performance gauge for retailers, rose 9 percent, compared with growth of 7.8 percent in the previous quarter. At the same time, gross margin fell to 22.4 percent from 36.7 percent a year earlier as the company wrote down the value of excess inventory. 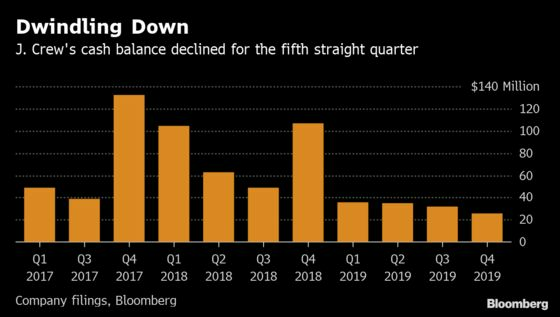 Cash fell to $25.7 million from $31.9 million the previous quarter. The results help explain why the company parted ways with Chief Executive Officer James Brett, who left in November -- and may raise pressure on the company to find a replacement. J. Crew, which now splits the CEO responsibilities between four senior executives, quickly undid some of Brett’s work, like dropping lower-priced Mercantile products, after his departure. J. Crew’s Madewell line continues to be a bright spot. The denim brand, which is making up a growing proportion of the company’s sales, saw revenue rise 26 percent. Sales of J. Crew’s namesake brand, however, fell 4 percent. J. Crew will refocus on its core products this year and pivot away from “sub-brands that did not resonate with the consumer,” according to Raya Sokolyanska, an analyst with Moody’s Investors Service. The company is “well positioned to capitalize on continued strength in denim and its overall popularity with the millennial consumer,” she said in a research note. Debt holders initially balked at the retailer’s results. The company’s first lien term loan due 2021 fell as much as 11 cents on the dollar to around 62 cents, before returning to 3 or 4 cents below the previous level of around 72, according to people familiar with the pricing. The company’s debt remained over $1.7 billion -- similar to a year ago.